Pumpkin has undeniably taken over the Internet in the form of a Virtual Pumpkin Party. To be honest, my knowledge- as well as experience- with the much loved winter squash can be summed up in one word, non existent. When I think of a pie with an orange tone custard center, wrapped in buttery pastry dough that flakes when pierced with a fork, my mind immediately conjures an image of a slice of sweet potato pie. Not that of a pumpkin. My only memory of cooking with pumpkin was when I decided to make a pumpkin pie from scratch, as in even the filling. Using the largest pumpkin I could find-which I would later learn was my first mistake- I began a journey into the hell of trying to scrap and carve the great pumpkin that Linus was so desperately in search of. Then roast it, then puree it, then burn it. The pie that is. There should also be a book titled “It’s the brunt pumpkin, Charlie Brown”. Needless to say my pumpkin pie fell flat. Flat into a dark brown with flecks of black abyss. And I threw that pie along with my thoughts of culinary pumpkin perfection in the trash. Recollections of that experience and the concave center of that pie, brought me to the intersection of soufflé lane and pumpkin street. There is one question that people who read this site always ask me. 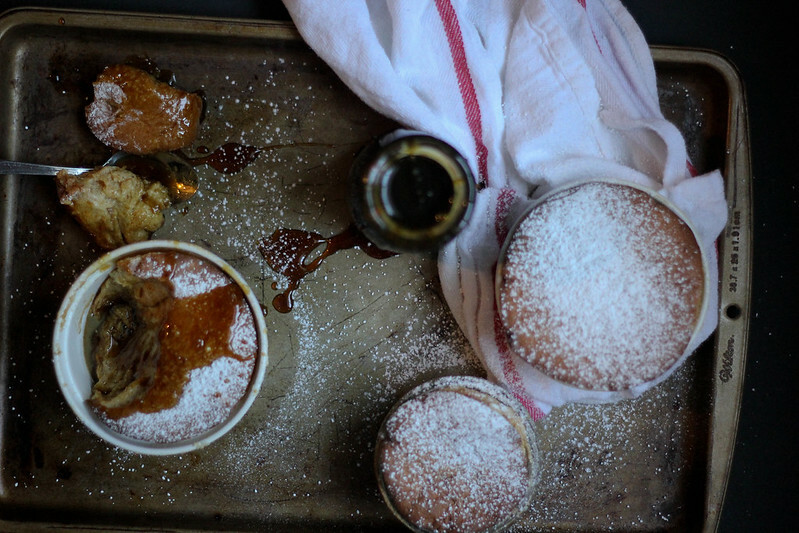 “Why Southern Soufflé? In college I used to cook meals on a hot plate in my dormroom. I was pretty good at it. To the point people would come by on Sunday and eat American sliced cheese over drop biscuits and collard greens off of paper plates by my door. As long as you had $5.00. 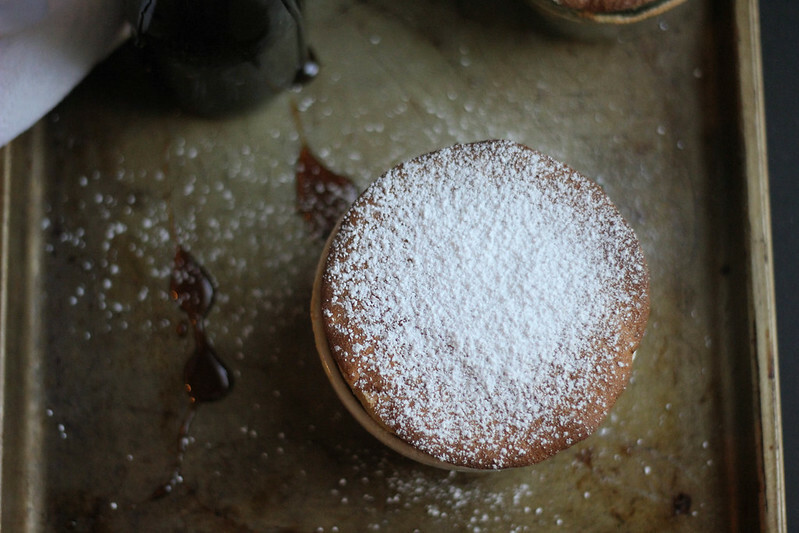 A rich dark chocolate molten soufflé is also one of my desserts. With that, we come to the Sorghum Pumpkin Soufflés on the menu today. 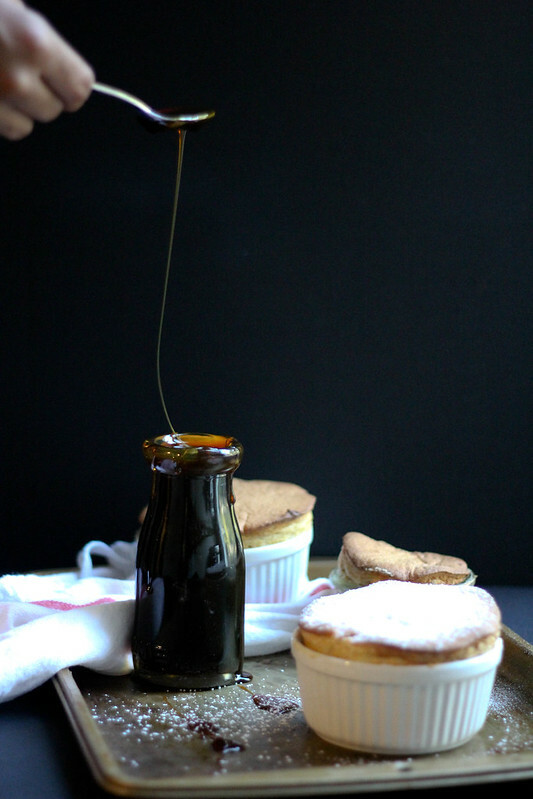 These soufflés are little domes sweetened with Sorghum Syrup which is beloved here in the south. The spices and pumpkin give them a gingerbread flavor in each light bite. In addition, so these puffed up confections wouldn’t be left feeling naked and afraid, I sprinkled the tops with powdered sugar and drizzled each with a little more syrup. Big Shoutout and Kissy Face Emoji to Sara at Cake Over Steak for bringing all of us together to share our pumpkin creations with the #VirtualPumpkinParty realness. In a small heavy saucepan, whisk together milk, cornstarch and spices. Bring to a boil over medium heat. Be sure you’re whisking constantly to ensure the mixer is smooth. About 2 minutes. Remove from the heat and whisk in pumpkin and sorghum. Transfer mixture to a large bowl and allow to cool to room temperature. Beat the eggs and salt in the bowl of your stand mixer, adding the ¾ cup of granulated sugar a little at a time. Beat until whites hold stiff and glossy peaks. About 3-4 minutes. Fold about a third of the whites into the cooled pumpkin mixture, then fold the remaining whites gently into the mixture making sure to thoroughly combine. 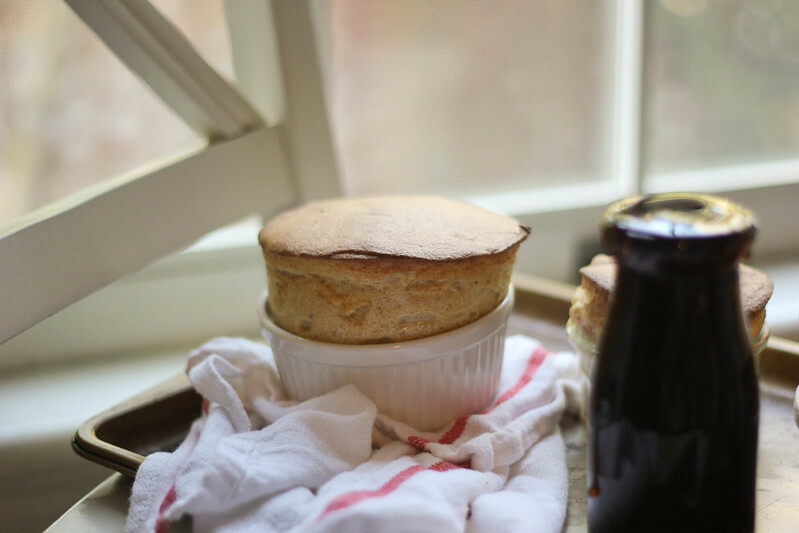 Bake soufflés for 15- 20 minutes or until puffed and golden. Dust with confectioners’ sugar and a drizzle of sorghum and serve immediately.